Celebrating fifty-one years today of Doctor Who – and four weeks today of our marriage. If the printed version of the reading given at our wedding was too baffling, here is Maius Intra Qua Extra delivered with much more pace and energy – on video! Many, many thanks to four very lovely men: Nick Campbell (hair) and Simon Fernandes (hat) for performing for us; Simon’s partner Barry for shooting them; and Nick’s partner Jon for looking sweet in the bottom of shot. And, of course, to Richard, for marrying me. 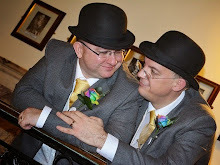 If any reader happened to record any other part of our wedding (or another take of the reading) on their hand-held devices, please let us know, as we’d love to see any videos that any of you have. New-fangled moving pictures were, alas, something we never got round to sorting out, so thank you again, Barry. 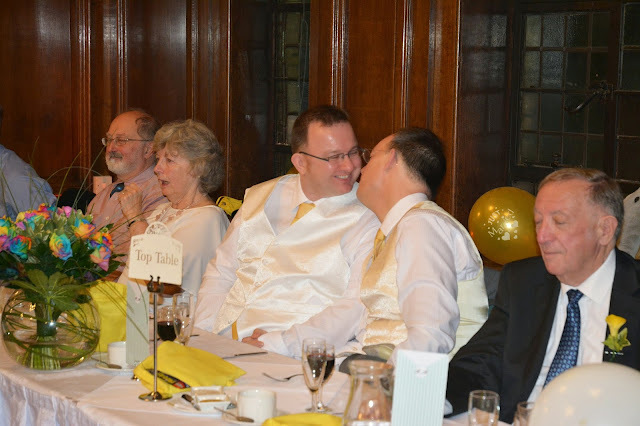 Richard and I are currently sorting through wedding photos for our next project, but here’s one that I particularly like: a shot from during the ‘gratuitous sexual innuendos’ part of the reading, showing the reactions of the two delighted grooms – and of our parents. Fantastic. I notice no-one’s yet overcome the intimidating number of mashed-up Doctor Who quotations to hazard identifying any of them, so before I just give up and attribute them all, here’s another attempt to get some comments (please chip in either below or on the previous post). If you’d like a hint for what’s left, though it was all assembled into one piece by Alex Wilcock and Richard Flowers, there were a few other writers. As is traditional, with additional dialogue by William Shakespeare. But mainly by David Whitaker, Gareth Roberts, Terrance Dicks, Paul Cornell, Russell T Davies, Anthony Coburn, Rona Munro, Ian Briggs, Ian Stuart Black, Robert Sloman and Barry Letts, Graeme Curry, Christopher H Bidmead, Robert Holmes, Simon Guerrier, Marc Platt, Jim Mortimore and Andy Lane, Ben Aaronovitch, David Fisher, Terry Nation Tom Baker, Stephen Wyatt, Robert Banks Stewart, Bob Baker and Dave Martin, Anthony Steven, Kit Pedler and Gerry Davis, John Lucarotti, Johnny Byrne, Matthew Jacobs TV’s Eric Roberts, Andrew Cartmel, and Peter Harness. Thanks to them all, and to so many others.